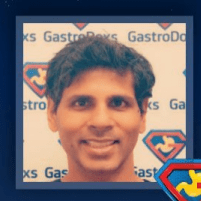 If you notice a burning sensation, nausea, or a persistent sore throat, schedule an appointment with Gastroenterologist Specialist Bharat Pothuri, MD, FACG at GastroDoxs in the Greater Houston Area of Cypress, North Houston, Texas. Longtime Houston resident, Dr. Pothuri and his staff answer questions and provide information and care in managing acid reflux. If you are one of the estimated 20% of Americans suffering from acid reflux and Gastroesophageal Reflux Disease (GERD), call or book an appointment online today for your comprehensive diagnostic consultation. For more information about the cause of your heartburn and the best treatment options, make an appointment with Dr. Pothuri and his dedicated GastroDoxs team. Many factors can lead to the stomach valve not closing correctly or fully allowing acid from your stomach to enter your throat causing uncomfortable stinging known as heartburn from acid reflux. Call and make an appointment with Dr. Pothuri to discuss your symptoms and eating habits. What other factors affect acid reflux? Hernias, obesity, and pregnancy cause extra pressure on the valve closing your esophagus. Without proper support, this valve can’t close completely, causing acid reflux. Careful monitoring by Dr. Pothuri reduces your risk of GERD. Dr. Pothuri may recommend avoiding fatty or spicy foods and coffee or alcoholic drinks. If making changes to your diet doesn’t relieve your symptoms, prescription medication or surgery performed by the GastroDoxs team is an option. While having occasional heartburn is common, ongoing acid reflux can wear away the lining of your esophagus. Without specialized treatment, acid reflux may develop into GERD. Trust the advice of an expert gastroenterologist, Dr. Pothuri, at GastroDoxs in Cypress, Texas for your complete exam and treatment plan. Call today or use the online booking feature now.